Could spring be on the march? I dream that I am going along, as one normally would in a days journey. Cleaning up here, doing school, perhaps calling a friend up to go see a movie. Always, though, there is a nagging sense that I have left something behind, or that I am missing something really important. Like a great grandfather clock in the hall, always in the back of my mind, silently overruling me. I search the drawers, I look through the creaking cabinets, through my backpack and in my car. Unable to remember, unable to call upon previous memories to look back on, unable to do anything but continue on and hope that it wasn't terribly important. Nothing can be too great to leave behind, right? I can't sleep. I keep having this dream. I think that today I have had it about 4 times, and I can't for the life of me know what it is about. I've been feeling really sick lately though, maybe it is just my mind messing with me. But I am not one to easily discount anything that presents itself, so I am going to pray about it and see if anything comes up. It is rather interesting though, just today in my Psychology class we started discussing dreams and what effect they have on us, or what (if anything) they mean. Maybe it is just our mind trying to have some fun and kick back after all that algebra. Maybe it is nothing more than pictures simulated by our memories and thoughts that have prevailed throughout the day. Perhaps. Or could there be more to it than even our great science can analyze? Maybe it is one of many ways our father speaks to us. Maybe those dreams about you running but not moving anywhere are saying something more than you consumed too much milk before bed. Could it be that our dreams are a link-albeit a thin and unstable one-to something deeper than can be determined by process or analysis? Oh wandering soul, where do you go? Where does the wind carry you? I found a really neat website (poetrysoup.com [my user is 'xslim92']) that is basically the handbook for all things poetry. I have recently submitted several poems and am really enjoying all the support and stuff. I wanted to publish (here of course, my true place of writing) a poem that I just recently put up there. It is in a form called "Sedoka" which is a japanese poem that is 5-7-7 syllable construction. But don't worry about trying to find it, I think the most beautiful part about poetry is simply enjoying it. Can I show my love? Is there any way to speak? But in time grow cold"
But where was I to go? If I was forced to choose one thing to do for the rest of my life, it would be writing; it is built into me, it is in my blood stream. Writing means so much more to me than simply conveying my message to people, it is a way of sharing are showing my life. But the more I write, the more I have come to realize this: The writer does not simply choose the words, the words must also choose the writer. I have found myself trying to write a song or a poem one way and it turn into something completely different. Sometimes, it is almost like I am just going along for the ride and letting the words carry me downstream. Then there are other times where I feel like the words are bleeding out of me, out of my heart, as if it were alive and it's own entity. I have found that if I keep myself open to this force, to this ocean of beauty, that it will often carry me much further and deeper than I ever intended to go, and I will become lost in it. So in Avatar (If you haven't seen it, stop reading right now and buy a ticket for the next showing) there is this idea of pure souls, or seeds of the sacred tree, that are so in connection with Eywa (their Mother God) that they will often serve as diviners, making Eywa's will clear. I caught on to this idea, and, as I often do with symbols I find around me, tried to find its counterpart in our world. Something so in sync with God, so in touch with his love, so pure, that if we listen hard enough, we can almost hear his voice. "But the thing about them is they know that strength is not just being strong, but being gentle too." Wow. "Where did that come from?" I asked him. He replied with, "I just heard the movie better than you did Chris." What else known to man? What else could he need? A timeless work of art? Where are the pure of heart? Who will never fall apart? Who seeks my walk in you? Who do not speak, but do? Your daughters just the same? Who treats her as a rose? Who searched as though for game? To sail the wide expanse? To capture her in words? Who will sing of her to birds? To pull her from the ground? To cherish what he's found? A righteous man of you? Who's heart is pure and true? 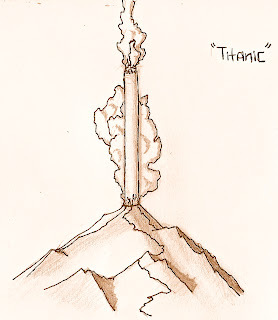 Wow, Titanic. Theme of my life the last few months. It is a story of a fight with God, yes, like me and then God and then fight. It one of the hardest days of my life thats for sure. It all happened over our christmas vacation this year. I had prayed a lot over our vacation, asking that God would make it a time of renewal as well as a time to break me down and destroy the boundaries I had formed over the year. I did not even realize just how much junk had built up, how much there was holding me back from walking with God. Out of this journey, though, came so many songs and lyrics and poems, and that was one of the problems. I found (as you may have read in my post 'Letters On a Page'), that I was almost using the time I had with God, that I was taking his love for granted and that I was seeking for my own to some degree. So there I was, on the back porch writing out in the freezing (quite literally) cold. I had been writing some lyrics and then all of the sudden, it stopped. I could not think, I could not write, I was helpless. I started talking to God and asking him what was going on. No answer. No explanation. Over the next half hour, I talked myself up into a rage, a burning anger that God had left me. We took some family pictures (I tired my best to smile the whole time) and then I eventually felt called out to go on a walk, like God was pulling a rope at my neck and beckoning me. Sitting beneath a rotting oak tree, I started unloading it all; I felt like I was punching God over and over and over. "Why are you not here? Is that really love God? You say you would never leave me, but you are a liar". As I write these words, I realize just what I was accusing Him of, what I was saying of Him. Yet as I flailed my arms and threw my punches, I just heard these subtle words in the back of my mind: "Unload it all. Lay it all down on the ground", and so I did. When I was all worn out, when I had nothing left to say, I sat there for several minutes, not really expecting God to say anything, yet waiting all the same. I started talking again, kind of calming myself down, trying to find some reason in what was going on here. Then it hit me, like a semi-truck on the highway, totally blindsiding me. It was not God that was closing His hear, it was me. Wow. I sat and wept for what felt like hours. Was I really closing myself off from God? My hot tears melted the packed snow beneath me; I now saw what God had been trying to show me all week. God is not the words that come from me, He is what the words come from. Now I know, now I have seen. He has grown me in this brokenness, he has used this pain to bring about healing and new life. And for that it was worth every moment and every tear. Well, that is most of my story (kinda long I know; I need to put my blog on a diet). After I took off a few days from writing, I came up with this song to put words to my week. Thanks for reading all of you out there. As I start back to school and get back into the system, I not surprised, but shaken all the same to find that the world only cares about one thing. How does his life end? What is the solution to this math problem? How does the world end? They are so caught up in what will be that they miss what is. What is his life? What are the steps in this math problem? What is God doing in the world now? These are the questions that I have been awakened to, questions that do not exactly satisfy the human desire for answers, but rather give me a deeper view of life around me. It is also very liberating to not have to know how my story ends, or what will become is my relationship with so and so. I think that that can sometimes keep us from living our lives in total oneness with God. Although he may know everything, he walks it out one step at a time and does not rush. It is the journey, not the solution that is the truest part of life. You call my name, 'Come back my love! The words that I say are not enough. They are just letters on a page without the inspiration, the life that drives those words. When God writes in me, something amazing happens; a connection is formed between me and God, between heart and pen. I can say what is truly on my heart, what I am feeling with him. Every time I try to recreate that bond, that unity, It always just turns into a bunch of scrap paper if anything. I cannot write without Him, I cannot sing without Him, I have nothing good besides what he has put in me. I am confronted by this sobering truth every time I try to write words that are not put into my heart, words that I speak from my mind. The fact is this; I find myself using God to get what I want from him, namely songs. How wrong is that? I have totally abused his heart and for what? A catchy tune and some neat words? No, I will not do this one more day. God, the words that you say are the words that I will write, no more, no less. This certainly does create an unconventional little world though, relying on God to write, but it is worth it to me. It is worth not knowing when or where I will be inspired to have the pride of my father reading over my shoulder as I write. Well God, where we go from here is a mystery to me, so I'll let you drive this time. I have noticed something in the past few years of my life, something that I always sensed, but never knew what it was. God has pulled me apart from most of my generation for some reason that only he knows. He took me out of public education, he has pulled me away from the stereotypical 'boy friend-girl friend' game, he has given me his love to shine, and he has instilled in me a willing heart to follow this journey. I do not know where it will lead, or what all that I go through is for, but I know that I do not want to take the other route. He forged a strong connection with me and I can only trust that He knows the bigger plan in all of this, that he choose me for a reason. He has pulled me out of confusion and ignorance into a world that is way over my head. My only prayer is that he will find in me good soil and that wherever this path leads I will be able to follow.